Help save more lives by putting your talents to work to raise money for the ASPCA. From a lemonade stand to bingo night to a pie eating contest and everything in between, you can host a fundraiser that works for you. Every dollar you raise furthers the ASPCA’s groundbreaking work and helps build a more humane country for animals in need. Getting started is easy. 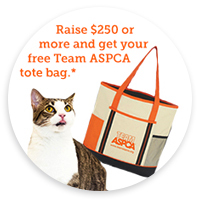 Click the button to register and create your personalized Team ASPCA fundraising page. Share your page with your friends and family on Facebook, Twitter or by email. Saving lives starts with you! Need help? Contact teamaspca@aspca.org. The free Team ASPCA Online Toolkit includes customizable signs and flyers for promoting your event. It also contains party printables like straw flags, donation jar labels, and paw print decorations! We also provide you with banners to use to promote your event on socials – like Facebook cover photos and Instagram images. What kind of fundraiser can I host? If I am hosting an event, what is the best way to collect donations? Do I have to register/login first to start creating my fundraising page and access the Online Toolkit? Yes, you must register your event in order to create your fundraising page and download the Online Toolkit. Is there a minimum age requirement for registering a Team ASPCA Fundraiser Event?